Getting push polled by my union? My union e-mails me surveys. The right way to get member sentiment is to let chapter discussions happen, filter up from Chapter Leader to District Rep to the leadership on the 14th Floor of 52 Broadway. Unfortunately, that chain is weak or broken. There are schools without Chapter leaders, chapter leaders who do not meet with their chapters or meet without discussion, chapter leaders who do not pass on information to their District Reps, DRs who do not solicit member thoughts from CLs, DRs who ignore schools where they do not get info, DRs who are afraid to share negative information with the 14th Floor, and times when 14 does not hear what some DRs are saying. But even though it’s not the right way for a union to listen to members, certainly not to listen to chapter leaders, I fill them in. Last week I got a letter from Michael Mulgrew (well, signed by him, not actually from him, see below) asking me to fill in a survey that would just take 15 minutes (it took me more). I was tooling along, answering what borough I was in and what I taught last year (I filled in for the year before, because of sabbatical), when I got to THE QUESTION. So I could check Community School, since some of the ideas of providing services make sense, but I really don’t know full details. The others are just plain unacceptable. “…there are a number of schools that have been struggling for many years to raise student achievement….”? We know that there are schools in poor neighborhoods where kids don’t do as well. And we would like to help more kids succeed. But “student achievement”? That’s what Cuomo, Rhee, Gates, Duncan etc call test scores. Do we really want our union to use “Klein-speak”? And do we really want our union to focus on test scores? This sort of language is embarrassing. In fact, the whole question accepts the premise that if a school’s scores are low, the school must be bad. Didn’t the delegate assembly reject exactly that premise just two weeks ago? Isn’t the battle against that very premise part of the battle to preserve public education? I decide to skip the question. Nope. They won’t let me leave it blank. Now we have another problem. They are serious about choosing two. I know what they want. They want me to push “more PD” – but teachers used to hate PD. And most NYC teachers still do. And I don’t think PD fixes schools. The best PD is voluntary, and out of the building. NYCDoE Professional Development is top down, and supervised. In some schools it’s gotten better, but it’s still neither what most teachers want, nor what most teachers need. And what is that “external support”? And why are they asking teachers who are not in those schools about what teachers in those schools should have to go through? Finally, I try clicking “proceed” with just “community school” checked off, and despite the warning it lets me move on. 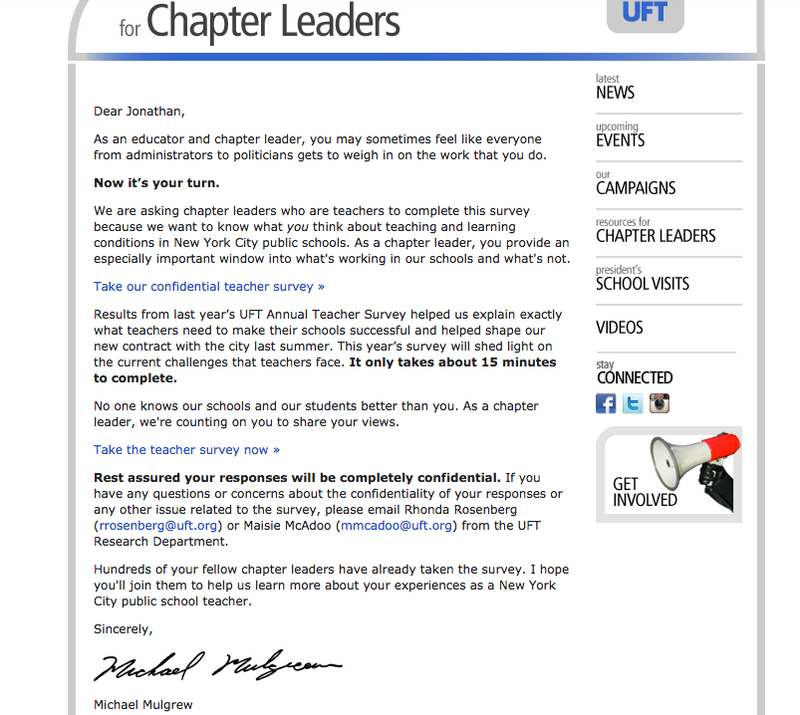 Push polling doesn’t really fit with respecting teachers’ voices. This is your best blog post in a long time as I fully agree with everything you say. I also checked community school after having left it blank. 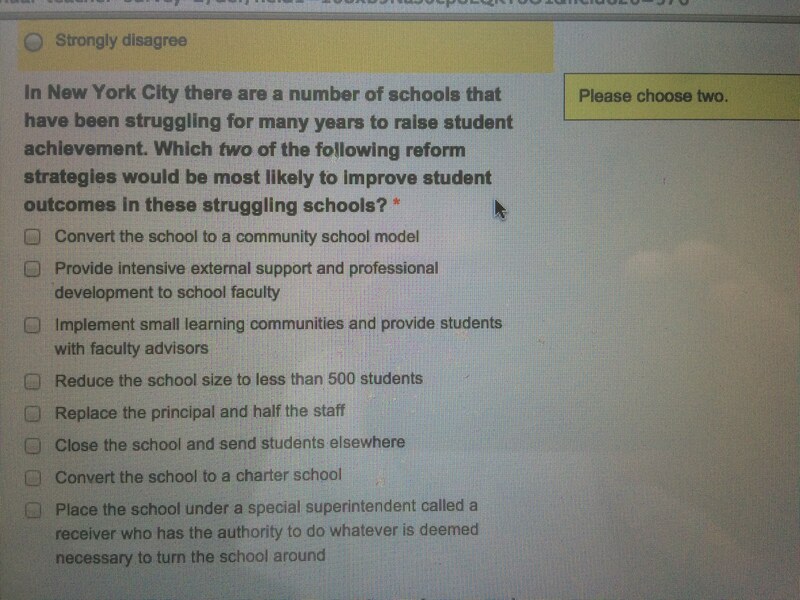 I was pretty upset there was no option for lower class size, or actually doing something about poverty. There was also nothing about offering appropriate instruction for ELLs, which is gonna be much tougher to do with the reworked NYSESLAT testing Common Core instead of English acquisition. You have done a good job here of reporting the difficulties and frustration felt by any sincere teacher trying to fill out such a form. While one might say that it is a good thing that the union is polling its members, when the framework on which they are doing it is so cockeyed, one feels disgusted and hopeless. Many years ago, I compared what the educational establishment, with the collaboration of our union leadership had done to teachers. students and, indeed, K-12 education in this city and probably in this country to what might happen, during the operation of a mathematical proof, algorithm or computer program, from repeated divisions by zero. All that followed after the very first such division would be mathematically meaningless. It is possible that repeated divisions might have a rectifying effect, much as random errors tend, statistically speaking, to cancel or average out — but, unlike in the latter case, such a thing is unlikely for divisions by zero. The situation in other countries might not be that much better, being, from what I have learned, worse in some ways and better in others. Of course, human affairs are not quite mathematics. What has happened is that policy decisions, directives and “reforms”, well-intentioned or not, have had neither any real method of prior information gathering and consultation, seeking input from the schools and their teachers, nor any method of seeking feedback and correction. The fact that most teachers, like their supervisors, are obedient or intimidated employees, unlikely to raise a fuss has compounded the problem. However, given such difficult situations made worse, teachers have scrambled, and students have worked, to try to make sense of things and continue with the basic business of teaching and learning. Human ingenuity is great, and human labor is cheap, especially when much of it is done outside official paid working hours. So we have struggled along, accepting things, however nonsensical and stressful, as “that’s how it is”, and even succeeding in some measure with the real task in hand — until the next grenade is thrown at us, or the next wrench is thrown in the works. Then we scramble again, expending ingenuity and labor in an endless effort to either fix the immediate problems, both long-standing and recently created, or, sadly, as so many of us do, to simply “flow” with them. While the first way may be greatly arduous, and the second easier for survival’s sake, it is clear that the former is unsustainable, while the latter only leads us further, more swiftly and smoothly, into educational hell. But this is what we have been doing for decades now, to deal with these “divisions by zero” at a human level. Returning to the mathematical example, it is clear that the only way to proceed in that case would be to throw out all the nonsense that had been generated by the computations and logical steps undertaken following the very first division by zero and made worse by subsequent ones. But can we do this in the case of the schools? I would argue that we should try. Anything else will only compound the problem. Logic based on false premises leads to nonsensical conclusions. In human affairs, actions based on such conclusions lead to tragic results. We saw that in the case of our foreign wars, Iraq being but one obvious, recent example. Human time and labor are too precious to be squandered. This is true for both teachers and their students — or at least the subsets of both of these groups whose members are sincere. Many of us spend our working lifetimes trying to do the right thing but only digging ourselves deeper in a hole. This is not how it should be — and the hell with “This is how it is.” That phrase describes an attitude that is part of the problem. Sadly, that has now been supplemented with, “That’s how it’s going to be.” This “American fatalism” leads nowhere. What we need to say is, “How is it that we are going to make it be?” This can only be done collectively. Our union does not provide us with leadership or assistance in this. It is firmly rooted in the attitude described by the two previous phrases. In human affairs, there is at least one element that is absent in mathematics, including the financial calculations that seem to be driving the changes in K-12 education. In addition to reason, there is also compassion that guides humans, or should — particularly parents, teachers, healthcare workers and others in what should be caring roles or professions. Sadly, it is not just an absence of reason (in the sense of logical thought and also of questioning of premises) that is lacking in our schools. Along with an absence of teacher and parental input, feedback and correction systems, there is a singular lack of compassion. All the fancy verbiage of the edu-speak and all of the pseudo-liberal assumptions that are used to justify what has been going on in the schools and what is intended for them in the future cannot hide this stark reality. Patching it up won’t do.